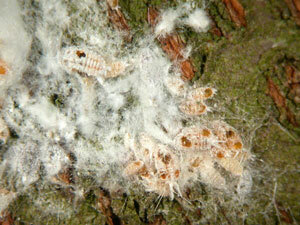 Gill's mealybug is a significant pest of pistachios that can also cause damage to almonds, grapes and persimmons. Our primary research objectives were to learn about this pest in pistachios (Pistachios), however we were also funded to work on this pest in almonds. The objective of this project was to document the seasonal biology of this pest in almonds, and determine how to best control it. 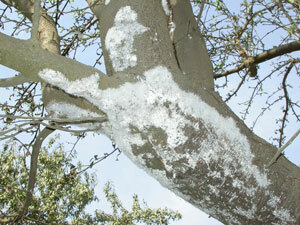 We documented that mealybugs overwinter under the bark in the crawler stage, feed on the sucker growth in the spring, and then move to and feed on the almond hulls by June. 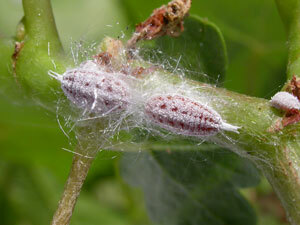 We also documented tremendous biological control such that mealybug populations in all research plots were undetectable throughout the remainder of the 2005 and 2006 seasons, even without the use of insecticides. Data from this project have been used to teach almond growers that if they do not use broad spectrum pesticides, and conserve native biocontrol organisms, that problems caused by this pest will go away.